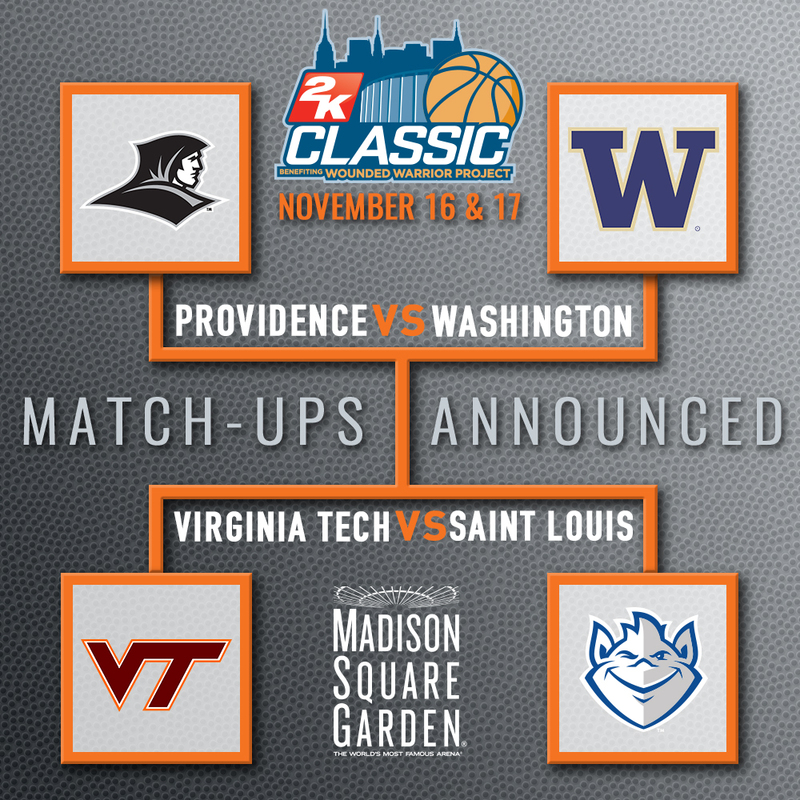 PRINCETON, N.J. – Providence will meet Washington and Virginia Tech will play Saint Louis as the schedule for the 23rd annual 2K Classic benefiting Wounded Warrior Project (@2KClassic) has been finalized. The 2K Classic benefiting Wounded Warrior Project is highlighted by Providence, Virginia Tech, Washington, and Saint Louis playing in the Championship Rounds presented by Continental Tire at Madison Square Garden on Nov. 16-17. In the semifinals, Providence and Washington will meet for just the second time ever. In the previous match-up, the Huskies earned a 60-51 win at Providence on Dec. 19, 1980. In the other semifinal game, Saint Louis will look for its first-ever win over Virginia Tech, which has won the previous seven contests, the last being in 1981-82. All four games of the Championship Rounds will air on ESPN2. This year marks the 20th year that The World’s Most Famous Arena will host the 2K Classic. Tickets for the Championship Rounds can be purchased at Ticketmaster.com or by calling 866-448-7849. Providence, Virginia Tech, Washington, and Saint Louis will host two games at home in addition to playing a pair of games at The Garden. They are joined in the 2K Classic by Belmont, Detroit Mercy, Houston Baptist, and Seattle. These four teams will meet in the Subregional Rounds at Belmont beginning on Nov. 18 when Seattle faces Detroit Mercy and Belmont takes on Houston Baptist in the semifinals. The consolation and championship games of the Subregional will be played the next day. Providence Civic Center – Providence, R.I.
Alaska Airlines Arena – Seattle, Wash.
Cassell Coliseum – Blacksburg, Va.
Chaifetz Arena – St. Louis, Mo. Curb Event Center – Nashville, Tenn.
Providence (Head Coach: Ed Cooley, Big East Conference) – Head coach Ed Cooley has guided the Friars to four straight NCAA Tournaments (a first for the program), amassing 89 wins over that span, including a 20-win season in 2016-17…in addition, in that span Providence posted four straight winning Big East seasons for the first time ever…in 11 years, Cooley has led his teams to 215 wins…the projected roster will be highlighted by five seniors – forward Rodney Bullock, guard Jalen Lindsey, point guard Kyron Cartwright, forward Emmit Holt, and forward Isaiah Jackson…Providence has earned 19 NCAA Tournaments bids, twice advancing to the Final Four…this will be the Friars’ first appearance in the 2K Classic. Virginia Tech (Head Coach: Buzz Williams, Atlantic Coast Conference) – Buzz Williams will enter his fourth season at Virginia Tech…after winning 11 games his first season, he guided the Hokies to a 20-win season each of the last two years, including this past year’s 22-11 record which resulted in an NCAA Tournament bid, marking the first time since 2009-10 and 2010-11 that VT has posted back-to-back 20-win seasons…this year’s squad will be led by senior Justin Bibbs and junior Ahmed Hill…the Hokies also look for the hopeful return of sophomore swingman Chris Clarke from injury…Virginia Tech has been to nine NCAA Tournaments and will be making its 2K Classic debut. Washington (Head Coach: Mike Hopkins, Pacific-12 Conference) – After 22 years as an assistant coach at Syracuse, Mike Hopkins takes over at Washington…in his time with the Orange, Syracuse went to 16 NCAA Tournaments, winning the 2003 National Championship, as well as advancing to four Final Fours, five Elite Eights, and 10 Sweet 16s…he inherits a team that returns three junior starters in Matisse Thybulle, David Crisp, and Noah Dickerson along with sophomores Carlos Johnson and Sam Timmins, both of whom saw action in every game a year ago…Washington, which has been to 16 NCAA Tournaments and one Final Four, previously played in the 2K Classic in 2013. Saint Louis (Head Coach: Travis Ford, Atlantic 10 Conference) – Travis Ford will enter his second season at Saint Louis with the rebuilding project well underway…guard Davell Roby and Jermaine Bishop, who are SLU’s top two leading scorers, lead a talented, young team that is projected to be vastly improved in the 2017-18 season…the Billikens feature four NCAA Division I transfers who sat out last season, three of which will be eligible for the 2K Classic…Saint Louis has been to eight NCAA Tournaments and will be making its first appearance in the 2K Classic. Belmont (Head Coach: Rick Byrd, Ohio Valley Conference) – In 31 seasons, Rick Byrd has led the Bruins to 662 wins in building Belmont into one of the premier mid-major programs in the nation…this past year, Belmont won the Ohio Valley Conference regular season title by five games and posted a 23-7 record which included a win over Georgia in the NIT…the Bruins will be led by seniors Austin Luke – who ranked second nationally with 7.1 assists per game – and Amanze Egekeze…Belmont has been to seven NCAA Tournament over the last 12 years…Belmont previously played in the 2004 2K Classic. Detroit Mercy (Head Coach: Bacari Alexander, Horizon League) – After serving as an assistant coach at Michigan for six seasons, Bacari Alexander returned to his alma mater last season to rebuild the Titans…last season, each of the top three scorers on the team were underclassmen, led by led by Horizon League Freshman of the Year Corey Allen, Michigan transfer Kam Chatman, and Jermaine Jackson Jr., son of legendary Titan Jermaine Jackson…Detroit Mercy, which has been to the NCAA Tournament six times, previously played in 2009 and 2013 2K Classics. Houston Baptist (Head Coach: Ron Cottrell, Southland Conference) – Houston Baptist is coming off its first two Division I postseason appearances, which include a 17-14 campaign in 2016-17…head coach Ron Cottrell, who will enter his 27th season at HBU in the fall, has won 469 games and is the eighth longest-tenured coach in the country…Josh Ibarra and Braxton Bonds lead a roster that returns 11 players…the Huskies will be making their 2K Classic debut in November. Seattle (Head Coach: Jim Hayford, Western Athletic Conference) – In 18 seasons, Jim Hayford has won 360 games and led his teams to nine postseason tournaments and he brings that to Seattle as he begins to rebuild the Redhawks…seven of 15 players are expected to return next season, led by 7-3 center Aaron Menzies and guard Zack Moore…the Redhawks last played in the 2K Classic benefiting Wounded Warrior Project in 2010. In the 2016 2K Classic benefiting Wounded Warrior Project, Michigan won its four games by an average of over 17 points a game to take the title. Zak Irvin followed his 16-point, seven-rebound effort from the 79-61 semifinal win over Marquette with 16 points and six rebounds in the 76-54 championship game win over SMU to earn Most Valuable Player laurels. The 2K Classic benefiting Wounded Warrior Project is produced by the Gazelle Group of Princeton, N.J. The Gazelle Group is a sports marketing firm, specializing in event production and management, client representation, and sponsorship consulting. Gazelle produces numerous nationally-recognized events, such as the Legends Classic, the Gotham Classic, and the College Basketball Invitational presented by Five Four. For more information on the Gazelle Group, please visit gazellegroup.com. The Northeast Conference (NEC) is the sponsoring conference of the 2K Classic benefiting Wounded Warrior Project. Now in its 36th season, the NEC is a NCAA Division I collegiate athletic association consisting of 10 institutions of higher learning located throughout six states. For more information on the NEC, visit the official website at www.northeastconference.org or follow on Twitter @NECsports.